The Regional Convention of Jehovah’s Witnesses will return to Mobile next Friday at the Mitchell Center. The convention will begin in Spanish June 24-26. The following two weekends will be English speaking services running July 1-3 and July 8-10. The theme this year is “Remain Loyal to Jehovah” and a participant can expect Bible discourses, demonstrations, singing and prayers and 35 video segments on several screens. The videos will present modern day dramas as well as Biblical period dramas. Last year the convention had around 5,000 guests and that many is also expected for each weekend of the convention this year, with the exception of the Spanish speaking convention the first weekend, which is expected to have around 3,000 guests. 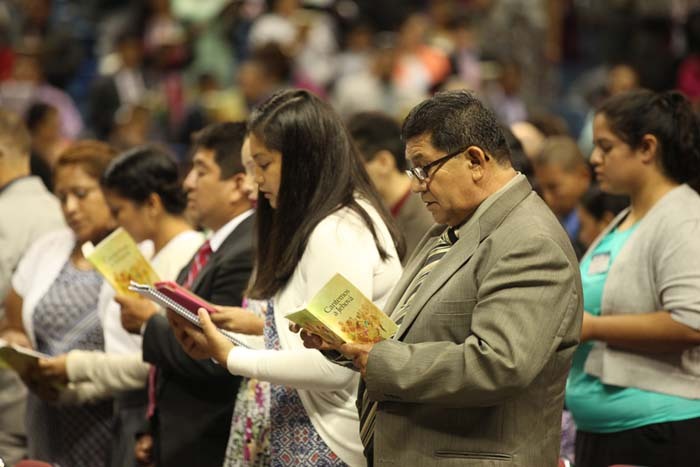 There are around 8 million Jehovah’s Witness worldwide, but around 19 million attend their meetings and conventions. They study with around 9 million people per week who aren’t Jehovah’s Witnesses and are known for their emphasis on evangelism through door-to-door teaching and preaching. “Before these conventions happen Jehovah’s Witnesses invite the public to attend our conventions,” said Benton Block, a third generation Jehovah’s Witness of 50 years and a media representative of the convention. Block explained that there’s often people at the conventions who drive from different states to come, and often people who attend the convention that aren’t Jehovah’s Witnesses but interested in what they represent. “[The public] comes to our meetings and they find that they like it,” said Block. “We use the Bible itself, everything we teach we have to show a scripture for it, or a number of scriptures. Our favorite thing to say is ‘let scripture interpret scripture,’” he said. Jehovah’s Witnesses are active in 238 different countries and have translated their literature into 750 languages. Thier website, www.jw.org gets around 2 million visitors per day and can answer many frequently asked questions that you may have about the religion.